After I upgraded the RAM in my computer, I expected a big performance boost. Well, I got a substantial amount of speed, but my computer was still a bit sluggish. 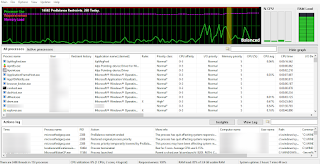 I later found out that my processor was being used nearly 70-100% of the time. Upgrading the processor isn't nearly as easy as upgrading most other hardware parts, so that was out of the question. Then, I stumbled across Process Lasso in a Give Away of the Day. Process Lasso improves performance by lowering the priorities of background processes. Other similar programs would attempt to raise the priority of the foreground process, which could lead to CPU lockups. 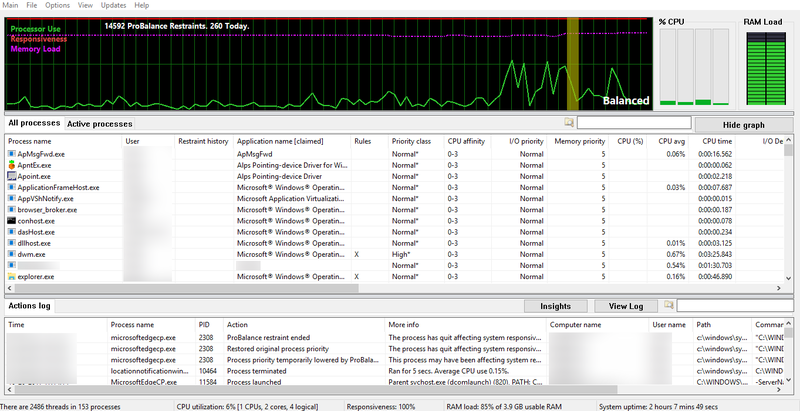 Process Lasso itself uses very little CPU usage, and even less if you close the GUI completely. It has a service which does all the detecting and priority setting. Process Lasso's UI appears to be a little techie-like. And it is, for those users who want to see what's going on. But, you don't need to use this at all - Process Lasso can do its work without having to click a button. In other words - you can close this geeky window without fear of shutting down the program. I use Process Lasso and recommend it. Even still, I have lockups, as Process Lasso can't do too much to processes. Nonetheless, Process Lasso helps Windows organize its processes, leading to better system performance overall. P.S. The only surefire way to restrain a program is by terminating it. However, we can't do this to essential processes, and we don't want our browser window closed just because we switched to Microsoft Word. I would believe, and admit that my only stale content is my podcast. My blog was at one time stale as well. I have had more time to do some updating,and I hope to publish a podcast this weekend. If you wish to make your own website,the best way to get many visitors is by simply keeping your website up to date. The Internet is filled with many "cobweb" sites, sites that were started long ago, but were never maintained. Even a small website like mine takes work to keep it fresh. I really thought about having a podcast where people can call in. Although I can set it up, I think it would be a little too early, being that I only have one podcast right now, and it wouldn't be worth my time to set up, anyways. Instead, I will still have live podcasting, but you will be able to chat - yes, in real time, as I speak. Obviously, it's easier to chat from your computer than it is to call in... well, to an extent. I plan to implement this after I get at least another podcast done - I also need to create the page, and maybe get a few others to help with the live commenting.